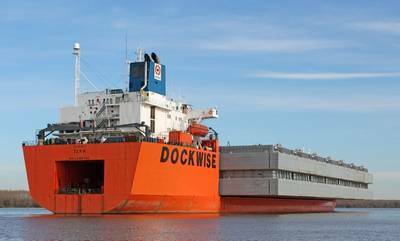 Dockwise, a subsidiary of Royal Boskalis Westminster N.V. (Boskalis) has been awarded a contract by Bechtel for shipping modules for the Chevron-operated LNG production Wheatstone Project in Western Australia. The contract value is estimated at approximately USD 275 million, making it the largest contract ever for Dockwise and work will commence in early 2014. The scope of work includes logistical management and transportation of over 100 modules from the Wheatstone Project module yards in China and Malaysia to the Wheatstone Project site located at Ashburton North, 12 kilometers west of Onslow in Western Australia. To complete its scope Boskalis will use its full breadth of heavy marine transport assets including an expected total of six Dockwise Heavy Marine Transport Vessels (HTVs) ranging in size from T-Class to Type IV open stern vessels, barges, Floating Super Pallets (FSP), two new SMIT Giant barges and Anchor Handling Tugs (AHTs). The HTVs will provide on-deck stowage for modules, as well as piggy back capacity for barges/FSPs also carrying modules, whilst the SMIT Giant barge - AHT combination will be used as a towage solution.